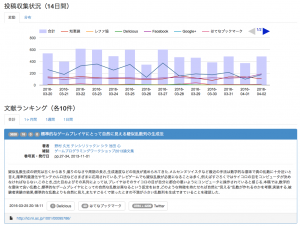 Altmetrics service for Japanese scholarly works such as articles, papers, or books. Ref: Mitsuo Yoshida (2014). New Challenge for Bibliometrics : Development of the Altmetrics Measurement Service [Japanese]. The Journal of Information Science and Technology Association. Vol. 64, No. 12, p. 501-507.